Yesterday The Smithsonian's National Museum of American History added hundreds of photographs, papers and historical objects to its collection to document the history of trans, bisexual, gay and lesbian people. And in case you're wondering about it, yes, the trans end was ably represented on this day. One of the trans items donated was a wooden tennis racket from Renee Richards, who turned 80 years old yesterday and was one of the newsworthy trans folks of the 1970's. After she was denied entry to play in the 1976 US Open because of a hastily enacted USTA women-born-women policy, she won a landmark New York Supreme Court trans rights decision in 1977. Another of the trans-specific items donated for historical posterity was the original trans pride flag created by longtime Atlanta based trans advocate Monica Helms back in 1999 along with a Transgender American Veterans Association button, a TransParentday.org rubber wrist bracelet, Trans and Proud and Trans Ally buttons and items from Monica's military career in the US Navy. This ceremony also took place on the 15th anniversary of the August 19, 1999 day she created the trans pride flag she is donating to the Smithsonian. Helms was in Washington DC for yesterday's donation ceremony and obviously thrilled to be representing the trans community on this momentous day. In her remarks she spoke to the importance of the 'T' being repped in this expansion of the National Museum Of American History's LGBT collection. Thank you Director John Gray, Katherine Ott, Jennifer Jones and Valeska Hilbig for all that you have done to make this moment possible. This is a historical honor for all transgender and gender non-conforming people across our country. We have always been part of America’s history since the beginning, yet we have also been marginalized the entire time. Now, the Smithsonian and the American Government are saying that our history is worthy of being displayed, along with that of our fellow Americans. The Transgender Pride Flag was created to give our community a unique symbol for us to show that we are proud of who we are. Not only have trans people in America embraced the flag, but trans communities in other parts of the world have also embraced it. If weren’t for them we would not be here today. The honor goes to the people of the world’s trans community. Transgender and gender non-conforming people of America are truly part of this country that we all love. And, since the Smithsonian will be displaying items from my military career, they are also acknowledging that we have contributed to the security of our country since the Revolutionary War. We only hope that the Department of Defense and President Obama hears this message and allows transgender and gender non-conforming people the right to serve openly in the military, like our gay, lesbian and bisexual brothers and sisters are doing today. Sea Monica shot me an e-mail before her departure to DC for yesterday's donation ceremony and I asked her a few questions. TG- What prompted the Smithsonian to seek to enshrine the original trans pride flag and when did they contact you? MH- I contacted the Smithsonian a year ago. They are starting to collect LGBT artifacts, so I contacted them at the right time. 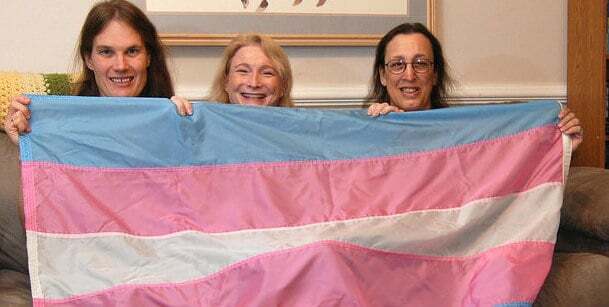 TG- How excited were they about getting the original trans pride flag and to your knowledge what other trans historical artifacts are going into their collection? MH- They were very excited. I was surprised. They became more excited when they understood how important this was to the trans community. TG- How soon will Smithsonian visitors be able to see it? MH- It may take them a year or more before the display is put together and put out to the public. They will let me know. It will be on permanent display versus temporary. It will be in their Armed Forces Flag display section, because I was in the Navy. So how important is this? BFD important. Just as it happened when the April Ashley exhibit opened last September in her hometown Liverpool Museum, it notes to the world and our haters that transpeople exist. It loudly says to the world we have a proud history we can show to our transkids and others that The Smithsonian thought was worthy enough to be enshrined in its National Museum of American History halls. It's one of the reasons I participate in efforts locally and elsewhere to document trans history on behalf of my African-American trans community. It's why I keep a lot of my papers and memorabilia around so I can pass them on so future generations can enjoy them. Thank you Sea Monica for helping to ensure that when The Smithsonian was looking to expand the LGBT collection, items representing the trans end of the community were included. Moni's Back In Da Ville! Will Oklahoma Electoral History Be Made Today? 2014 US Little League World Series Champions! History Repeating Itself In Chitown? HRC Deja Vu At SCC 2014? HERO Repeal Petition Is Invalid! Happy 53rd Birthday President Obama! Why Y'all Tripping About This, White Trans Women?